LAKE BUENA VISTA, Fla. -- Interactive bug releases, colorful art displays, family-fun activities and how-to gardening sessions add plenty of themed fun to every weekend of the 13th annual Epcot International Flower & Garden Festival April 21 through June 11. Each of the eight festival weekends features a special theme with events and activities that add to the daily festivities. 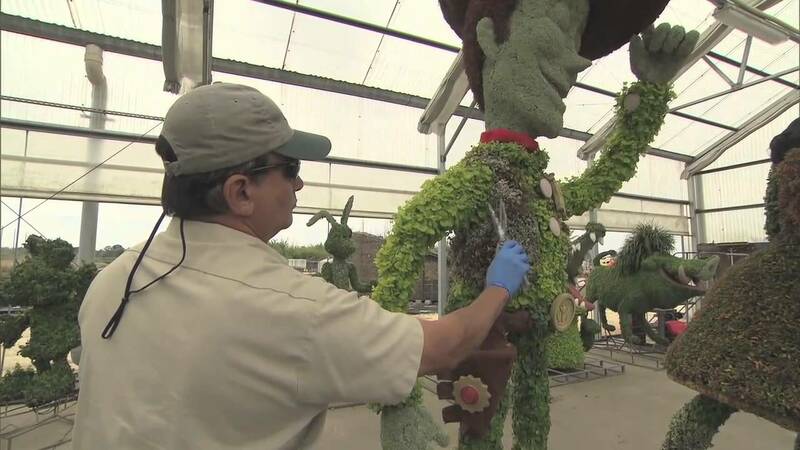 Epcot opens with 30 million blooms, topiary magic, gardening activities and U.S. Postal Service launch (9:30 a.m., April 21) of its Art of Disney Romance commemorative stamp. Nelson launches the Flower Power concert series at America Gardens Theatre. Paul James, a.k.a. "The Gardening Guy(" and host of HGTV's "Gardening By the Yard," answers gardening questions and provides helpful insight into this popular hobby as part of the Great American Gardeners series presented by the American Horticultural Society on April 21, 22 and 23 at 11 a.m. and 2 p.m.
New Romance stamps go on sale with first-day cancellation offered to Disney guests. Beloved Disney characters host a garden party for guests at the Ultimate Backyard Garden Party presented by The Home Depot, where luau, wedding and birthday party areas showcase ways to throw a big bash. Guests can extend their pinkies for a Future World tea party, then celebrate their "unbirthdays" in Alice's Unbirthday Party near the Sculpture Garden in Future World. The Home Depot and FamilyFun magazine host special kids' activities. Gary Puckett belts out nostalgic tunes during the Flower Power concert series. Roger Swain, past host of PBS's "The Victory Garden," shares his gardening know-how. Twelve artists working in various mediums throughout the weekend will create a variety of works in the Epcot gardens. Guests also can observe nature through the eyes of 16 plein air artists May 6 and 7. Paul Revere and the Raiders rev up the Flower Power concert beat through the weekend. Renowned wilderness photographer Clyde Butcher joins Robert L. Bendick Jr. of The Nature Conservancy to talk with guests about their passion for the outdoors. Festival poster artist Michael Sullivan signs his artwork for guests all weekend. Children can enjoy the Kids Paint Out experience located inside the Sculpture Garden daily from 10 a.m. to 5 p.m. A half dozen easels and special paint bottles are set out for kids to paint freehand (or any other style) with the assistance of a professional artist nearby. Members of the Florida Federation of Garden Clubs exhibit a spectacular display of floral arrangements at the Festival Center. Moms are treated to a complimentary photo and a flower exclusively on Mother's Day, May 14. Photo locations can be found throughout the park. Families can celebrate mom at the Mother's Day Brunch May 14 at World ShowPlace. Times are 9 a.m. to 4 p.m. on Sunday. Guests can make reservations at 407/WDW-DINE (939-3463). Flower Power great Davy Jones makes moms swoon during daily concerts. Guerlain perfume specialist Raymond Western talks about the intimate relationship between perfumes and plants like those displayed at the France pavilion's Fragrance Garden. Children can create the perfect Mother's Day card. Dozens of Disney characters pop up throughout the park for a character extravaganza. The Home Depot hosts gardening-related activities and hands-on fun throughout the weekend. FamilyFun magazine features kid craft activities at the Test Track walkway. B.J. Thomas makes Flower Power concerts sing each weekend day. Butterfly curator Jaret Daniels tells guests how to bring winged beauties to their gardens. The brand-new Tinker Bell's Fairy Garden showcases a glittering Tinker Bell topiary and provides fun for everyone, especially younger children. Older children can blast off on the SpaceNet climber near Minnie's Magnificent Butterfly Garden. On May 21, from 11 a.m.-4 p.m., artisans showcase handcrafted dolls and teddy bears. Children ages 3-9 can take part in Field Day activities near The Land with beanbag tosses, relay races and other outdoor fun. Fans dig The Guess Who in concert for Flower Power fun. Pat Lanza, author of "Lasagna Gardening," dishes up tips about growing herbs that taste great in Italian dishes. Guests discover that bugs are fun and keep gardens healthy. Disney's Animal Kingdom bug specialists appear in Future World East to give guests a close-up look at caterpillars, spiders and other creatures. Gritty Arlo Guthrie brings guitar, harmonica and classic folk to the Flower Power concert stage. Robert Bowden, director of the lush Harry P. Leu Gardens in Orlando, discusses great Florida plants. Ladybugs will be released more frequently throughout the I Dig Bugs Weekend. Central Florida gardening celebrity Tom MacCubbin caps the Great American Gardeners series with advice on creating imaginative container gardens. Herman's Hermits starring Peter Noone wrap the Flower Power series with their lively British brand of rock. Festival poster artist Michael Sullivan signs his artwork for guests Friday, Saturday and Sunday. Surprise craft activities help kids wrap up their festival fun.